There is no place like Rome for the holidays. Two of our books are set there and the Eternal City, well, I admit it’s my favorite. It is an easy bias because, over the course of writing Molly Goes to Rome and The Shield of Horatius, I learned so much. I love talking about Rome. Amy has a few more pencils and more tricks to show off these days. So, we’re revising it. The story won’t change, though one misspell will be corrected. 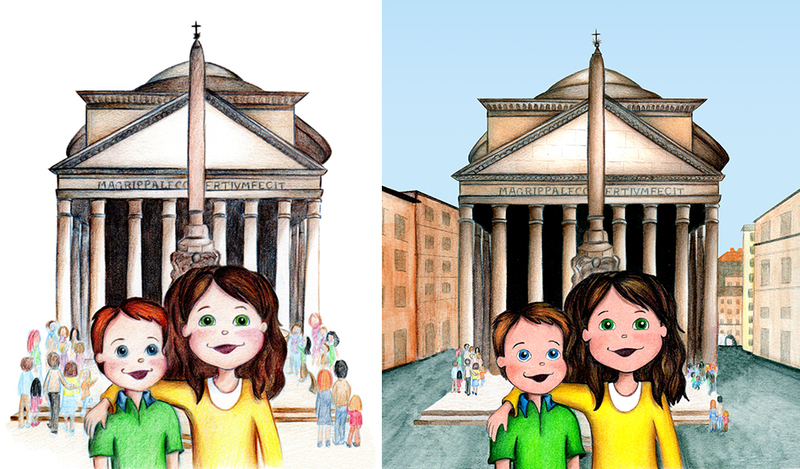 There will be a new illustration for the cover and each of the existing illustrations will get a makeover, as this one, featuring the Pantheon, has. The revised edition will be out in the next couple of weeks. We’re very excited to do this. While you’re here, let’s talk a bit more about Rome. 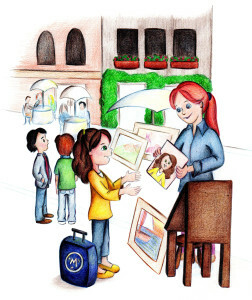 One of the locations featured in Molly Goes to Rome is the Piazza Navona. The Piazza is a plaza with three fountains, the most famous of which is the Fountain of the Four Rivers (Fontana dei Quattro Fiumi) by Bernini. The fountain and square area is a large oval. Some of my research indicates it represents what was once the competition ground of the Stadium of Domitian. This may or may not be true as the oval also defines the street that runs around the square. What is true is that portions of the stadium remain and are visible when you take a stroll. One of the striking aspects, maybe because I was only there at night, is how enclosed the area feels. There is no visual continuity for the small streets that lead into the piazza. In other words, you can’t look down the street to see other buildings, etc.. When you’re on a tour looking for the next thing is a natural thing to do. The Piazza Navona, however, forces you to reckon with it, to appreciate it. The old illustration, soon to be updated. Molly in the Piazza Navona. There was another reason for me to appreciate it. I visited Rome as a student in my teens. The excursion to the piazza was not a planned one, and only a couple of students were invited. I was thankful then and continue to be grateful for this. Then, as now, the piazza had a good place to get gelato. After we confirmed it still existed, there was no question that Molly and Michael would find their way to it. Our contributor to the book, who was born and raised in Rome, agreed it was an excellent place to include. Part of the charm includes the art market that sets up there. This is depicted in our book where an artist does a drawing for Molly. If you’re going, particularly if you travel with kids, the Piazza Navona is not to be missed. Copyright © 2019 CO Author. All rights reserved.